Are you in middle school or about to enter it for the first time? If so, keep reading to find out how you can maintain good grades and get the most out of your middle school experience. Entering middle school can be a challenging transition. 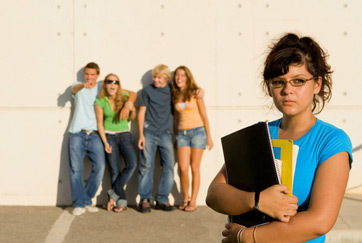 You and your classmates are entering puberty and discovering new facets of your identity. In order to stay focused and maintain good grades, it's useful to be aware that all of the other students around you are up against the same basic challenges. If you're able to create a balance for yourself and juggle the various aspects of your new life, chances are you'll be able to get good grades and also have time to enjoy middle school. You'll change as a person once you leave elementary school and so will your social circle. You'll likely become more independent, but it's helpful for you to stay just as involved with your parents or guardian as you were before, as well as your teachers and school counselors. The more you maintain communication with the adults in your life, the more help you'll get when you need it. You may be worried or anxious about many of the new things that you'll face at school, from new teachers to older, intimidating students to remembering your locker combination. The rise in academic expectations can also be difficult. It may take a bit of time and adjustment, but eventually you'll get used to the greater workload both at school and at home, as well as the changes in your schedule and the increased expectations of others. You probably started taking notes in elementary school. In middle school, it often becomes necessary that you take notes in class and are well-organized. If you have all of the key points and sub-points of any given lesson, it will make studying for tests and completing homework assignments less of a daunting task. Make sure that your notes are organized by class, subject and date so that you can easily find what you're looking for when reviewing. If you miss a lesson, be sure to ask a classmate for his or her notes so that you can remain on top of any new information. When it comes to grades, your efforts outside of school are as important as your performance at school. If at all possible, set aside an area that's exclusively for homework and studying. Maintain an uncluttered and organized study space. Having a consistent schedule is also key to budgeting enough time for homework every day. Finish your homework and start studying for tests a few days in advance to make sure that you've thoroughly absorbed the information. Sometimes, schoolwork can be too difficult to complete on your own. If necessary, don't be afraid to ask for help or tutoring. Many options are available at school, online and at home depending on what you need. If you find that you're having a hard time getting the grades that you want, help is around the corner if you're willing to seek it.